Flight jacket may have become stylish and classy lately, but been a cult classic for ages. Originally designed for army aviators, they have fitted right in the fashion industry. Who has expected before that those guys can fly through catwalks and streets as well as in the air? The black will never let you down. Well, here is the greatest example — black bomber under black top paired with black skinny jeans and heeled boots. It is easy but looks put-together. Spring is outside! So, it’s time to get your mini dress from your wardrobe. Wear it with a jacket in pastel tones. Combine it with the same color boots. The best way to get noticed (in fashion) is by showing your back to people so they can see your mark as a manifesto. You won’t have any problem with attention while wearing this new Dior Poison Girl bomber. Look to this outfit where vintage camel bomber mixed with a burgundy silk top, black jeans, and embroidered suede ankle boots. Easy, but stunning. Has somebody told you bomber jacket couldn’t go as a classic element? If yes – don’t believe them. Here is the perfect combination: black turtleneck under Valentino Funky Dragon Satin Jacket that couldn’t be paired better with anything else than black wide trousers. A beautiful concept with all pieces from your wardrobe while keeping you safe from gentle spring zephyr. Going back to the original: let’s look at this ultra-color outfit which reminds us about iconic hip-hop staples that come in athletic or super graphic and quirky — silk bomber, track pants and Nike classic Cortez leather. This look is as classy as possible. Wear your bomber jacket (especially with faux fur stole) with a pleated satin midi skirt. Belt “cinch” or “nip in” your waist, so you will look and feel more feminine while not trying too hard. Match up the belt with the bag for the natural conclusion of your in-style-position. Personal style means breaking the rules so here is the right lesson how to do it — wear your bomber jacket with a mini skirt and heels. Moreover, sticking to a monochrome color palette isn’t necessary. Sometimes spring days although sunny but aren’t warm enough for wearing just a top, however you want to! The best solution would be to throw on your favorite jacket. Add a piece of magic by wearing fur sandals. 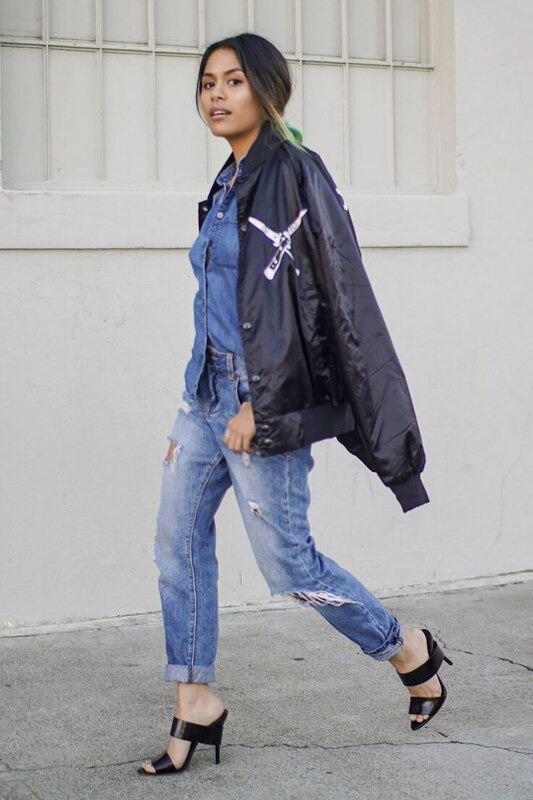 To provide femme and tomboyish charm, go for sporty bomber jacket over a t-shirt that worn as a dress and use overknees-boots-trick to make outfit sexier. Denim works well together with everything, so confidently wear black silk bomber against your day-to-day denim shirt and jeans. And don’t forget about your inner chic voice — black heeled sandals. Miss the 80’s vibes? You can feel it through your outfit — cigarette trousers and basic white tee covered with patch bomber jacket, completed with right accessories like fedora hat and Ray Ban glasses. Voila, mission accomplished. Another day, another way to restyle a bomber. Here isn’t just another ordinary idea to wear a dress with jacket. If you are bored of blazer — try pink bomber jacket instead. The result will look smart and refreshed. Don’t be afraid of mixing your favorite pieces from a wardrobe. As an example here is silk bomber with red elements that matches with red heels & black leather pants. Japanese bomber jacket is one of those items which works with everything you can imagine or get from your closet. A little party never killed anybody! Last but not least – a suit of A-line midi skirt, heels, and wool bomber jacket. Who says it doesn’t look professional?